Fri., Feb. 12, 2016, 7 p.m.
Books and boxes bound in plastic wrap waited to be moved, while teachers and administrators packed their few remaining belongings. Chris Jorgensen, server administrator for the Central Valley School District, was helping move earlier this month and preparing to start hooking up computers in their new space. “It’s kind of an elaborate dance between all the departments,” he said. Jorgensen was one of many helping to pack up Mica Peak High School, formerly Barker High School at 13313 E. Broadway Ave. The school is one of five Central Valley schools moving between Jan. 22 and Feb. 19. 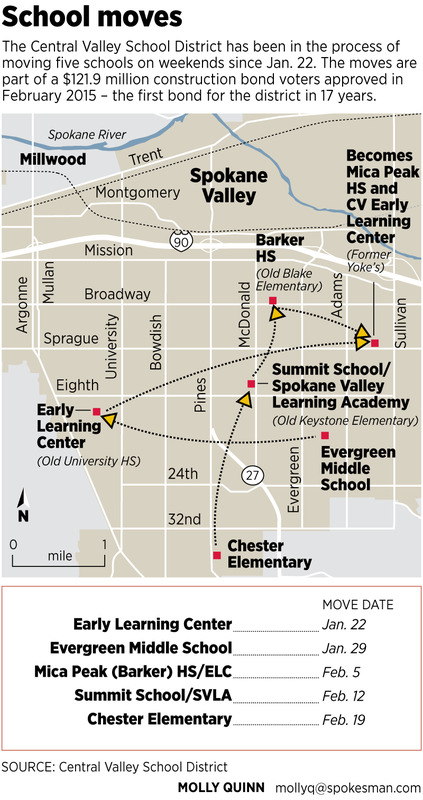 The five moves are relocating 300 staff and more than 2,200 Central Valley students. The renovation of the former Yoke’s supermarket on 16 N. Progress Road prompted the complicated game of musical schools. The renovation, as well as the moves are part of a $121.9 million construction bond voters approved in February 2015 – the first bond approved in Central Valley in 17 years. The district purchased the Yoke’s building in 2014 for $2.4 million. The moves will allow Chester Elementary and Evergreen Middle School to be fully remodeled. Eventually the original University High School and the former Keystone Elementary School buildings will no longer be used as schools, said district spokeswoman Marla Nunberg. The district may sell them or use them for storage. The linchpin of the move, the Yoke’s supermarket remodel, integrates two very different student populations. Mica Peak is the district’s alternative high school while the Early Learning Center is for children between 4 weeks and 6 years old. Central Valley Superintendent Ben Small is quick to point out that although the two schools share the same building, they have separate facilities. “This building is really divided into two and the interactions will be planned interactions,” Small said. The building itself is a large, brightly lit space with modern supplies and facilities. The two schools have their own dedicated entrances, although they share some common space – including a cafeteria and a gym. At every step of the way Small said teachers and administrators in each school gave feedback and input about how to best design the new space. The ELC classrooms are broken into pods, said ELC Director Barb Sattler. Each pod is centered around sinks and toilets – there are 43 total in the Early Learning Center for the 515 kids. “For us, this consumes a vast amount of our time,” Sattler said. Additionally, some of the ELC classrooms open up to outdoor playgrounds. The high school has an art room with gallery-style lighting, a science lab with shared work stations and communal study space. Many of the high school rooms are separated by a garage door allowing them can become one large space. Classrooms in both schools with exterior walls have windows, while classrooms farther in the building have skylights. Both Mica Peak Principal Kamiel Youseph and Sattler want their students to interact. The goal is for the older students to mentor younger students. However, they aren’t certain how that will look. Although they’ve discussed offering credit to high school students if they help teach ELC kids to read, or lead them in physical activities. The new building and the school moves represent a larger, district-wide focus on providing options, Youseph said. In addition to the Yoke’s remodel, a number of other schools in the district are being remodeled using bond money. Chester Elementary (expected completion August 2017), Greenacres Elementary (September 2017), Sunrise Elementary (August 2017), Opportunity Elementary (January 2018), Ponderosa Elementary (December 2018) and Evergreen Middle School (December 2017) are all being remodeled and expanded. Liberty Creek Elementary in Liberty Lake will be a brand new building. Construction just started and is expected to be finished by August 2017. Published: Feb. 12, 2016, 7 p.m.